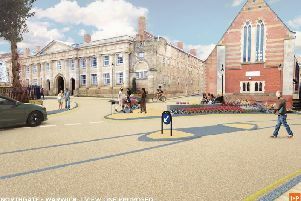 Artist impression of the Myton Green site. The first phase of major infrastructure works for a major housing development in Warwick is due to start. Consent was granted for the site wide infrastructure and public open space works for the land between Myton Road and Europa Way, by Warwick District Council last year. The development, which is called Myton Green, will see 735 houses built on the land. Catesby Estates plc, working in partnership with the Europa Way Consortium, have appointed contractor Dawnus on site from the week commencing May 7 for site mobilisation and hoarding erection, with the infrastructure works starting from the week commencing May 21. The works are expected to last around 56 weeks and will include the delivery of the first section of a tree-lined spine road, which will eventually link Europa Way with Gallows Hill, along with the creation of an extensive green corridor adjacent to Myton Brook. Jonathan Babb, technical director at Catesby Estates, said: “We are working closely with the Consortium, Warwick District Council and housebuilders to ensure Myton Green is a vibrant, high quality housing development with recreational space for the whole community to enjoy.